Panderbear is a chart-a-holic. A well-designed chart can convey a fundamental truth with astonishing clarity and conciseness. This particular chart plots average inflation-adjusted income in the post-WWII era as a percent of 1979 levels. The data displayed show that until the administration of President Ronald Reagan, percentage growth in income for the top 1% and the bottom 90% tracked one another quite closely. Then something went haywire. 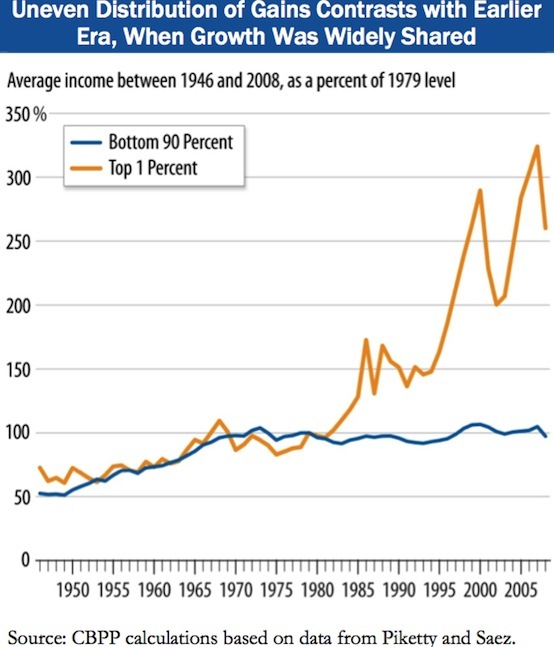 Income for the top 1% began to climb dramatically while income for the bottom 90% flatlined. All the economic gains since shortly after Ronald Reagan was elected have gone to the rich and none to the non-rich. What happened near the beginning of the Reagan administration? Well, Reaganomics happened. The twin pillars of Reaganomics, aka supply-side economics, aka trickle-down economics, are cut taxes and reduce regulations. Top marginal tax rates for individuals and corporations were reduced dramatically and capital gains rates slashed. The theory was that cutting taxes and eliminating regulations would stimulate the economy and a rising tide would lift all boats. The actual result, as the chart clearly demonstrates, was a windfall for rich individuals and corporations. Nothing trickled-down. All the benefits gushed up to the wealthiest Americans. Reaganomics turned out to be an aberrant economic theory, voodoo economics, as even many fiscally conservative Republicans had feared. It failed, utterly and completely. Ronald Reagan tripled the national debt. That money went to the already well-off while the middle class was exsanguinated. It was the beginning of the end of the American Dream. President Reagan's legacy is the false dogma that we can have all the government services we demand and financial stability while cutting taxes on the rich and deregulating banks. Didn't happen. Ain't going to happen. Nevertheless, today's Republican Party insists that all we need is more of the same. Could you please state the source of the chart. Try as I might I cannot make out what it says. I just found this site. Thank you. A seminal use of panderer: From Dante's Inferno. If one counts the first two cantos as preface (they are) This is spoken in the exact middle of hell: Canto XVIII: a demon smites Vendico Caccianemico (notable for pimping his sister: Cosi parlando il percosse un demonio / della sua scuriada, e disse:'Via, / ruffian! qui non son femmine da conio.'" "Get out of here you pimp, there are no women here to coin." Conio fr. Latin conere "to stamp with a wedge" , cunnieform, making a piece of pottery into currency by stamping it, or, in short, treating women as things. I have seen similar charts and statistics that pretty much come up with the same conclusions. Which has prompted me to refute Newt Gingrich's recent "pandering" remark labeling Barack Obama as the "food stamp" president. I think that dubious distinction rightfully belongs to "The Great Communicator" himself. I grew up in these times having been born in 1948. I remember a sense of dread when Ronald Reagan was elected in 1980 (I voted for the incumbent Jimmy Carter). I didn't really understand it at the time. I do now. Thanks for the comment Tom. Panderbear was born in 1947 and had much the same reaction to the election of President Ronald Reagan. It has taken 30-years for all the poisonous fruits of Reaganomics to ripen, but they have finally succeeded in destroying the American Dream. That is the central issue of our time and of this election. By The Central Limit Theorem, I would expect the inflation adjusted income of the bulk of the population to track the rate of inflation. I would also expect the group three standard deviations out on the high tail of the population to break away from the rate of inflation. While I agree that income inequality is growing, I'm not sure I agree this chart is the most honest way to make that point. On the face of it, this argument appears false. If true, then it should also be true from 1945 to 1980, not only from 1980 onward. "Anonymous" makes no attempt to explain the discrepancy. I vaguely recall reading an article in the Financial Times or the Economist that argued that spike in income disparity was an international phenomenon, driven more by technology than government policies. I apologize that I do not have a link, but it would be interesting to see this compared to a sampling of other major economies to see how much of this is uniquely American. Thanks for the comment Jay. See http://www.panderingpoliticians.com/2011/10/wealth-gap.html for a chart showing where the U.S. fits internationally regarding the Gini Coefficient, a measure of the inequality of a distribution. A higher Gini coefficient indicates a more unequal distribution. The U.S. has one of the highest Gini Coefficients in the world. Your comment prompted me to review the various purported causes of income divergence. Technology is certainly a factor, as are failures in the U.S. educational system, but other countries have faced these same challenges without similar asymmetries in the distribution of income growth. For example, Germany is doing quite well and they managed that without destroying the labor unions that helped build the U.S. middle class, but are unrelentingly attacked by the GOP. Besides income inequality another thing that Republicans don't mention is the results of the beloved stockmarket when the repubs are in charge versus the Dems. Recent study by Bloomberg News shows the stock market does much better under Democrats. When the Republicans had a president (over past 28 years) The stock market averaged 3%. When the Democrats were in the White house (23 years) it was 11% return. Seven out of 8 recessions were started under Republican Presidents. Under Clinton 224% return, under Bush -22% and with Obama 56%. Things are entirely different today and the Reagan policies would be the wrong ones. Reagans own economists are saying this. Economic history shows this. The Republicans are not listening. Another excellent comment and another candidate for a full-fledged post. See my reply to your other comment. Maybe this is a shift in topic, and if so, I apologize. I'm no fan of supply side economics, but in fairness, would like to make the same point I make to its supporters: Reagan and W. never really gave it a try. That is, at the same time they reduced taxes on high earners, they instituted staggering spending increases -- in other words, they resorted to tried and true New Deal "pump priming" at the same time that they claimed to be running a supply-side initiative. Argue the patriotic reasons for the spending all you want, because spending is spending. While not the point of this post, the Republican claim is/was that Reagonomics would increase growth. My frustration is that it has always been combined with Keynsian stimulus, which renders any claims stongly suspect. My analogy: imagine Albert Pujols taking batting practice in a hitter's park with his favorite Keynsian bat. A supply-sider is standing behind the batting cage with a wooden rod that has a shiny star attached to it. Every time Pujols connects with the ball, Mr. Supply-side waves the stick and says the magic words "Laffer curve". Who, besides a "Conservative" politician (in quotes because I think they're closet Keynsians), believes that it was the magic wand that made the ball leave the park? No apology necessary for a thoughtful reply. One of the main problems with Reaganomics is that it puts the card before the horse by means of Starving the Beast. The idea was to create a fiscal crises by spending much more than collected in taxes creating unsustainable deficits that would be fixed by starving the beast of the social security net - social security, medicare, medicaid, etc. The problem is the theory is flawed and always has been, leading to every expending deficits and collapsed of an underregulated and overgrown financial sector. See, for example, http://www.panderingpoliticians.com/2011/10/starve-beast.html and http://www.panderingpoliticians.com/2011/10/starve-beast-part-ii.html.